Jemima Phelps is the designer, web wrangler and blogger behind Fiddle + Spoon, a lifestyle blog dedicated to food, travel, fashion, design, photography (and cats)! Dividing her time between Melbourne and her home state of Tasmania, she loves anything creative she can get her paws on! Hey beautiful M+Mers! Happy Spring! I have the most fabulous salad to share with you this week — a perfect daytime, warm weather dish, just the thing for a sunny day. 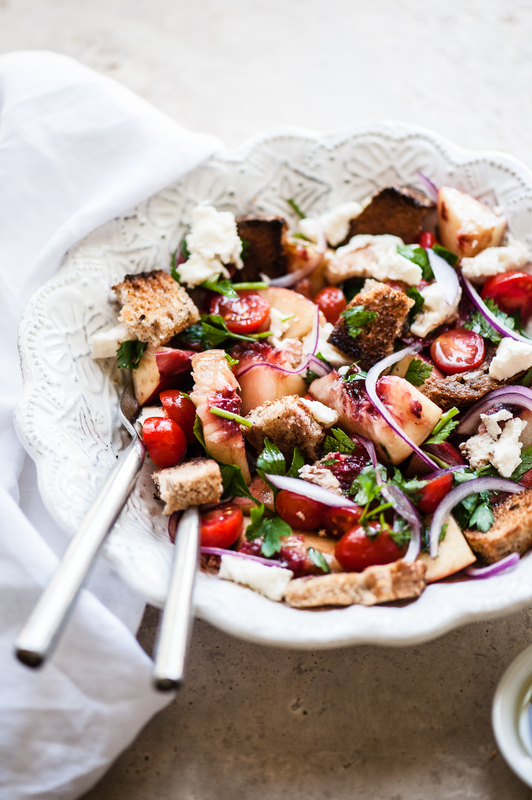 A panzanella salad is a traditional Tuscan dish of bread, olive oil and tomatoes, and a popular choice for a Spring/Summer salad. The peaches are the star of this particular recipe, and I have a few ripening in my fruit bowl for this very purpose as we speak!